Using Gson to convert Java objects to JSON and back. This tutorial explains how to use the Open Source framework Gson from Google to usage and purpose of Java JAR files. Gson is a Java library that can be used to convert Java Objects into their JSON representation. It can also be used to convert a JSON string to an equivalent Java object. Gson is an Open Source project, which can be found under https://github.com/google/gson The webpage provides a convenient download link. Gson can work with arbitrary Java objects including pre-existing objects that you do not have source-code of. For this purpose Gson provides several built in serializers and deserializers. A serializer allows to convert a Json string to corresponding Java type and a deserializers allows to convert from Java to a JSON representation. You can also configure Gson to use custom representations of your objects. Gson allows to serialize a Collections of objects of the same type. As the generics information is persisted in the JSON you need to specify the type to which you want to serialize too. For this you have different options. By default, Gson tries to map all fields in the Java object to the JSON file it creates and vice versa. But Gson allows to exclude certain fields for serialization and deserialization. GSon can for example not serialize Java Beans, as the IPropertyChangeSupport field lead to an infinite loop. Therefore you must exclude such a field from the JSON conversion. Use the transient keyword on your field to indicate that this field not not be serialized. Gson provides an the @Expose from the com.google.gson.annotations package which allows to define which fields should be deserialized. You can configure Gson to consider this annotation. You can register a custom exclusion strategy with the GsonBuilder and its setExclusionStrategies method. For this you would implement the ExclusionStrategy and its houldSkipField(FieldAttributes f) and shouldSkipClass(Class clazz) methods. You can define a custom annotation and tell GSon to ignore such fields. In this exercise you use Gson to convert a data model into JSON and the JSON back to Java objects. Create a Java project, download the Gson library from its homepage and add it to the projects classpath. Create the following data model. Write the following class to test the conversion. The following is your data model. Via the following class you can deserialize and serialize this data model into JSON and back to Java. In this example we exclude the field for the IPropertyChangeSupport. Copyright © 2012-2016 vogella GmbH. Free use of the software examples is granted under the terms of the EPL License. 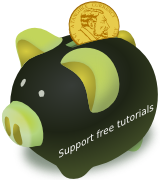 This tutorial is published under the Creative Commons Attribution-NonCommercial-ShareAlike 3.0 Germany license.